Cola, Gilbert (Gilbertus Cola), Manucaptor for Johannes Pope, Burgess returned for Ashburton. * I'm not at all sure what this is, as definitions all seem to be connected with people released on bail from custody. Someone who guaranteed the appearance of the burgess at the parliament?? Before the Reform Acts Ashburton was represented in parliament by 2 MPs. Ashburton was a borough constituency, ie mostly urban, as opposed to a county constituency, which is predominantly rural. "Paid 13th February 1797 the contents by cheque on bank £213 1s 6d James Lloyd"
Quoted by the Rev J B Pearson D.D. *Probably at the London Inn. James Lloyde was the landlord when the inn was sold in 1801 . Parliamentary papers, House of Commons and Command, 1832, vol38, part1. Lord John Russell, 1st Earl Russell, helped to write the 1832 Reform Bill, which increased the number of eligible voters. In March 1831 a meeting was held in Exeter by those in favour of Lord Russell's bill. 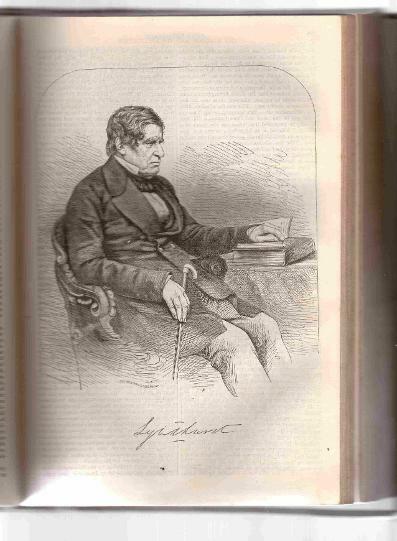 Edward Divett said that Dr T (= Dr Tucker) knew very well how the Borough system worked, because he had the 'misfortune to be connected to the Borough of Ashburton'. Mr Divett claimed that Dr T 'has not been there lately', to which Dr Tucker interjected 'Yes I have'. The Representation of the People Act 1832, ( known as the first Reform Act or Great Reform Act) disenfranchised 56 boroughs in England and Wales. It also reduced another 31 boroughs to only one MP - of which Ashburton was one. It also increased the number of people who could vote - but this still excluded most working men, and all women. Later the Western Times alleged that Ashburton only escaped being totally disenfranchised because of the census of 1831, which was held at the time of a fair. As a result 'gipsies, showmen, rope dancers and vagabonds' were enumerated as residents. In 1838 The Western Times reported on the case of The Queen v Henry Caunter, Gilbert Hearder Cole, John Knott and Richard Knapman, where the defendants were charged with riot and assault. It was alleged that they assaulted Robert Bowden and Richard Ford, using violence way beyond that which 'all men were ready to allow during election proceedings'. The situation arose because a man called Yeo rented two farms, one from a Liberal, and the other from a Tory. Not wishing to get involved in politics, and refusing to promise his vote to one or the other, he finally took refuge in the Golden Lion Hotel. William Baron was landlord at the time. A mob, allegedly incited by Mr Caunter and Mr Cole, arrived at the hotel to extricate Mr Yeo - stones were thrown through windows, the crowd attempted to smash down the door, and people were kicked and beaten. In the same year Mr Mann, of Goodstone, had been renting some fields from Lady Carew. He was ordered to give them up, and was replaced by a tory tenant. In 1841 the Exeter and Plymouth Gazette reported that some Liberals in Ashburton, despairing of winning the election, had ordered their employees 'Not to spend a single penny' with any shopkeeper of opposing politics. A month later the Western Times reported that the Tories had tried every method in their repertoire to convince a shoemaker to vote for them, from 'cajolery' to 'threats'. Finally a five pound note was discreetly passed to him, but he spent it on 400 3d loaves for the poor, which he distributed in the market place. William R Whiteway, a land agent, maltster and seedsman, is shown as living in Kingsbridge Lane in the 1851 census. 1857 The Western Times thought it 'disgraceful' that linhays (farm buildings) were being built in Ashburton solely for the purpose of giving people a property qualification, to enable them to vote. Later that year a report in the same paper describes the re-election of Mr Moffatt as Member of Parliament. The election took place in the crowded Chapel of St Lawrence, where Mr Moffatt arrived to great cheering, which lasted until he had taken his seat on the platform. The portreeve, Mr S Tozer, presided, and he began by reading out the portion of a parliamentary act that dealt with bribery at elections. He then asked if anyone would like to propose a candidate to represent the borough in parliament. The Rev N Parkyn then proposed Mr Moffatt in a speech punctuated by cheers and applause from the audience. Mr Heal seconded the motion. The portreeve then asked if anyone wished to propose any other candidate. 'There being no answer, he declared Mr Moffatt duly elected'. 1859 A committee looked into alleged bribery and corruption at a recent election. One witness, Robert Francis, a solicitor from Newton Abbot, described Thomas Widger being brought in to vote. Mr Atkinson and Mr Bovey held him up, as he swayed about. Mr Francis insisted that Mr Atkinson and Mr Bovey left the polling area, at which point Mr Widger sank into a chair. The returning officer asked whom he voted for, and he replied that he voted for Mr Astell. It seems that barristers, called Revising Barristers, oversaw the lists of who was entitled to vote. In 1843 Mssrs. Farrant and Lucena were about to visit Ashburton to perform this task. Their fees - £10 per day (each?) - were considered costly. In 1864 50 voters were struck off the electors' list for Ashburton, for not 'answering' the call: this involved attending a court for registration. The majority of these, said the North Devon Journal, came from those 'that can best be spared - the Tories'. This suggests that this is the election of 1865. Although this was after the First Reform Act, it was before the Second, and the number of 'The Working Classes' who could vote was still very limited. 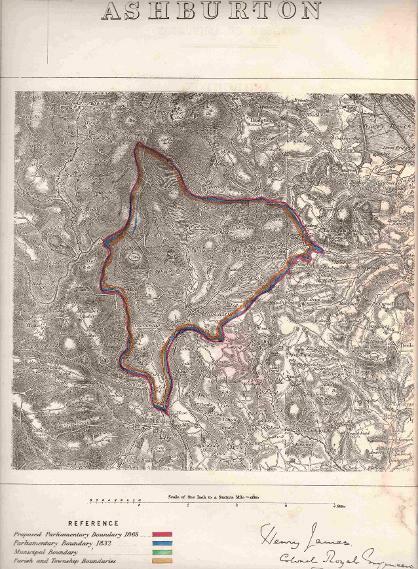 Above (from my own collection): This map from a disbound book (title unknown) shows the parliamentary boundary 1832 (in blue) and the proposed parliamentary boundary for 1868 (in red), both of which equal the parish boundary in yellow. 'The population in 1861 was 3062, showing a decrease of 1103 since 1831. 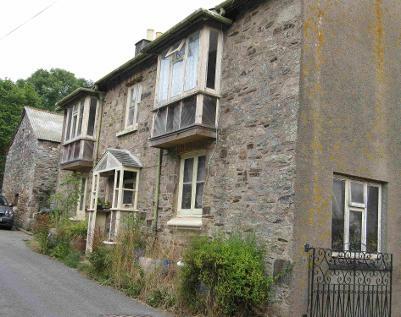 The number of inhabited houses in 1861 was 574. The population, computed in 1866 at 2892, has remained nearly stationary, and there appears no reason to suppose that it will materially increase. The borough comprises an area of 6966 acres. the Commissioners do not recommend any extension of the boundaries of this borough'. Ashburton finally lost its remaining MP with The Representation of the People (Scotland) Act 1868 (31 & 32 Vict. c. 48) It's last MP was Robert Jardine, nephew of William above. In 1868 Devon was divided into 3 divisions: North, South and East Devon. Each returned 2 MPs - Ashburton was part of the East Division. In addition, Exeter returned 2 members as a city, Plymouth, Devonport, Barnstaple and Tiverton returned 2 members each as Parliamentary Boroughs, and in the same capacity Tavistock returned 1. In 1871 East Division covered 160, 788 persons, of whom 73,950 were males. Of these, 10,199 were electors. At this time Sir Lawrence Palk and Sir J H Kennaway represented East Division. With the Franchise Act of 1884 8 new divisions replaced the former 3. Ashburton, Barnstaple, Honiton, South Molton, Tavistock, Tiverton, Torquay and Totnes each returned 1 MP. Exeter, Plymouth and Devonport also returned 1 MP each, whilst Barnstaple, Tavistock and Tiverton were disenfranchised. Electoral registers - sources in the Devon Record Office Exeter (now the Devon Heritage Centre): historical background. In 1892 Eli Routley, a labourer, was charged at the petty sessions with assaulting the Hon. R. Dawson. There had been a political meeting of Mr. Collins' supporters in the Town Hall, and warned that a mob was outside many had left by a back entrance to go to the London Hotel. It was when leaving the hotel that the Hon. R. Dawson was struck by an object thrown into his carriage. Notebook of Sir John Northcote, sometime MP for Ashburton and afterwards for the county of Devon containing memoranda of the proceedings in the House of Commons during the first session of the Long Parliament 1640. Above right: Detail of Sir John Northcote effigy at the base of monument he erected to his father John at Newton St Cyres Church, Devon. 'George, the 3rd Viscount Midleton, born 3 October 1730, and named after his Majesty...was chosen to the British parliament in 1754 for Ashburton in Devon. Members elected for the present Parliament. Charles Boon, a proprietor of Crawley's iron forges. *See the entry for John Sullivan, below. Robert, born 1717, was one of their children. For more on Robert Palk, see the section Ashburton and the East India Company. 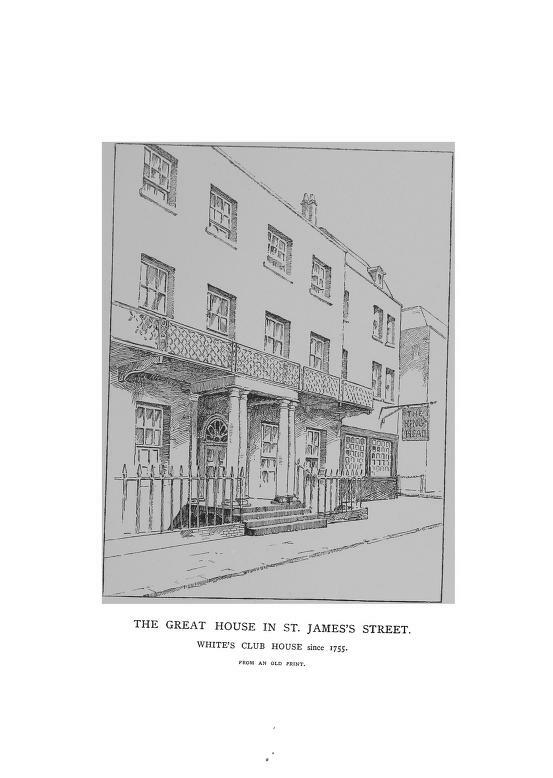 'WHITES, 38 St. James's Street, near Piccadilly, originated in a chocolate house, founded by one White, in 1698-1700, and converted into a private gaming-club about 1720. "White's Chocolate House, near St. James's Palace, was the famous gaming-house, where most of the nobility had meetings and a society" (vide Cole's Mss.). It retained its evil reputation until a comparatively recent period. Mary Arthur was engaged to Robert Macreth at the time of her father's death. He is mentioned in Robert Arthur's will, where he is described as a vintner. Robert Mackreth married Mary Arthur 22 October 1861, at St James', Westminster, London. Mary's father was named as Robert Arthur. 1793 May 13. This day Rob. 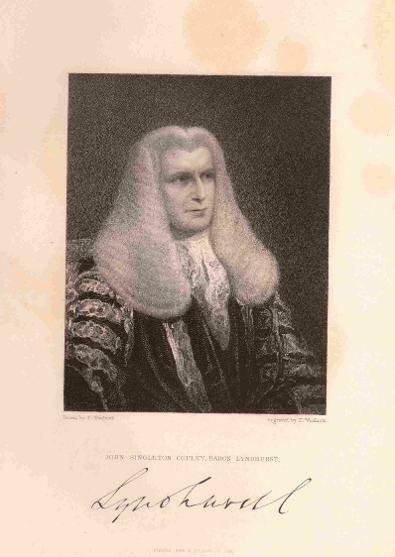 Macreth Esq., member for Ashburton in Devonshire, was brought up to receive the sentence of the court of the King's Bench, for having sent a challenge to Sir John Scott, the attorney-general; when the court, after commenting on the heinousness of the offence of duelling, aggravated by the circumstance of provoking a public character to such conduct, sentenced Mr Mackreth to six weeks imprisonment, and to pay a fine of 100l. Deaths. In Bruton-Street, Lady Mary Palk, wife of Lawrence P esq., MP for Ashburton, co. Devon. A fortnight before her delivery (which happened on the 15th of last month) this beautiful woman dreamed that she should not survive child-birth, and locked herself up and denied herself all company, while she employed her time settling her affairs. When she was delivered, the joy of surviving, and having the satisfaction of seeing the infant alive, carried her mind into the opposite extreme, and she died in consequence. 1792 By special licence, at the Earl of Lisburne's, in Harley Street, Lawrence Palk esq., MP for Ashburton, and only son of Sir Robert P. bart. to Lady Eliz. Vaughan, his Lordship's eldest daughter. The Palk family were established at Lower Headborough Farm, Ashburton. Walter was born in 1742, the son of another Walter* and his first wife Thomasine Withecombe (sometimes spelled Widdicombe). He took the place of Lawrence Palk as representative for Ashburton, when the former decided to represent Devon County, and served in four successive Parliaments. He died in February 1819 at Marley House. Born 1744, died August 1820. Became chairman of the East India Company. Colonel of the 2nd Regiment of the Royal East India Volunteers. 'A man of singular excellence, and of uniform consistency of conduct in all the relations of life'. Born 1780, died April 1826. A great great grandfather of Queen Elizabeth II, Bentinck was the third son of Prime Minister William Cavendish Bentinck, 3rd Duke of Portland, and Lady Dorothy. He was known as Lord Charles. Geo. IV Letters, i. 171, 173. 'The Earl of Lauderdale moved the insertion of a clause to make a provision of 500l (£500) per annum for Lady Abdy for life, the fortune she brought her husband having been 10,000l. The Lord Chancellor could not consent to 500l, and thought 400l, under the circumstances, would be enough. The Earl of Lauderdale agreed to insert 400l instead of 500l. 'Richard Preston Esq. was born at Ashburton, in Devonshire, and bred in the office of an attorney in that town. When out of his clerkship, he attended closely to business, and particularly to conveyancing, in which he shewed much dexterity and knowledge. Having obtained some valuable old law books and manuscripts, he compiled from them a large volume "On the law of contingencies and other settlements". Ashburton 1818. Sir Laurence Palk, (whose property is situated here) and Mr Serjeant Copley, are the members; both the former ones being changed. At this period, Sir Lawrence Vaughan Palk and Lord Clinton owned the majority of the property in the borough - on which the voting franchise depended. The Western Times maintained that 'these two gentlemen' supported each other. The Palk family represented Ashburton from 1767, but 'the political conduct of Sir L Palk had long excited their indignation...'. His voting against the Reform Bill finally led to his defeat. By 1843 he had sold his property in the parish to James Matheson, the current MP. 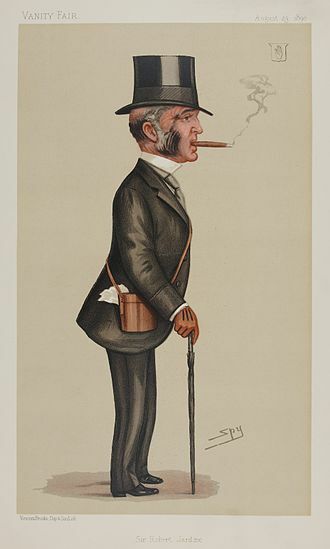 'The personal appearance of Mr Sturges was unprepossessing, and his manner in public neither dignified nor impressive; but, being thoroughly familiar with the affairs of government, and capable of producing, as occasion required, the varied information which long official experience usually imparts, he acquired slowly but securely the favourable opinion of the House of Commons; and his speeches - always respectable both for facts and reasoning - were heard sometimes with approbation, invariably with attention'. A political economist, editor of the Traveller and the Globe. Wrote 'An essay on the external corn trade' (1815) and 'An essay on the reduction of wealth' (1821). He was much in favour of colonising Southern Australia, and wrote a book on the subject. Torrens Island is named after him. Concise Dictionary of National Biography, OUP 1921. In May 1841 news reached Ashburton that Charles Lushington was resigning as their Member of Parliament. The new candidate, Mr. William Jardine, was described as a wealthy merchant, largely involved in trade with China*. One of the founders of Jardine, Matheson & Co. In 1845 the 'working classes' presented him with a snuff box, purchased by means of a penny subscription. The Western Times pointed out that the MP, one of the wealthiest individuals in the country, was delighted with his gift. He vacated the Ashburton seat in 1847 on being returned for the combined counties of Ross and Cromartie. In 1868 he retired into private life. His tomb in Lairg, Sutherland, Scotland says: 'Here rest in hope the remains of Lieut General Thomas Matheson, third son of Donald Matheson Esq of Shiness. Born at Shiness 28th Aug 1788 died at Achany 14th Feb 1873. He entered the Army in 1815 as 2nd Lieut of the 23rd Foot (Royal Welsh Fusiliers) in which regiment he served till promoted to the rank of Lieutenant Colonel in 1845. He represented Ashburton in Parliament from 1847 to 1852. Distinguished through life by a high sense of honour and christian principles. He was ever true to the sympathies of kindered friendship and suffering of humanity'. The Exeter and Plymouth Gazette admitted that they were not supporters of Mr Moffat. On his address to the Ashburton constituents in 1855, they concluded that their columns were better filled with local news, rather than 'any elaborate report of his voluminous twaddle'. On his election petitioners complained that 'bribery, treating and undue influence' had affected the vote. In particular, the debt of a voter named Leaman was allegedly paid by an agent of Mr Astell's, to prevent the voter being arrested. The confirmation of his election led to a great Conservative banquet in the town, followed the next day by a ball in the Market Hall. On the final day of celebrations, 'the poor were feasted'. At the 1865 election the portreeve, Mr Luscombe, was so overawed by the proceedings that he 'trembled like an aspen leaf. The Western Times claimed that Mr Jardine was 'one of the greatest benefactors the town has ever had'. When he died, the Dundee Courier calculated that he left real and personal estate worth approximately £2,000,000 gross. Head of Jardine, Matheson & Co., he was also a director of the Caledonian Railway Company and of the Scottish Provident Institution, and a 'prominent patron of the turf'. At the time of his death the Western Times noted that he was one of the Lords of the Manor (Lord Clinton being the other), and that he had provided the town with an 'excellent water supply' from his own lands. 3rd December 1910 - 14th December 1918. He was Lieutenant-Colonel Reserve Officers in the 9th Lancers during the Boer War and WW I. He was Deputy Lieutenant for Gloucestershire, a J.P, and was awarded the OBE in 1919. *Liberal Unionists were Liberal MPs who split from the party in 1886. They formed an alliance with the Conservative Party in Parliament, and in 1909 became the Conservative and Unionist Party. 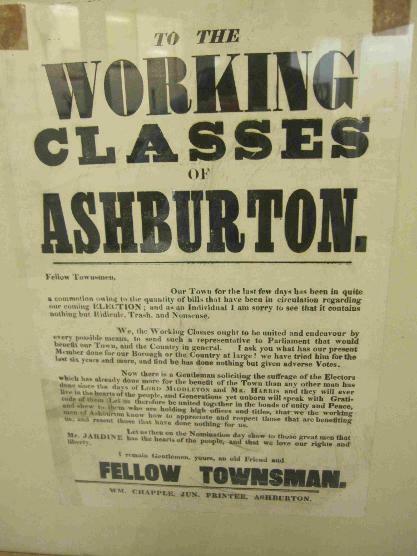 In 1841 the women of Ashburton were said to take a considerable interest in politics. Nevertheless they objected, with many others, to wearing the orange and purple colours of the Liberal Party, declaring them 'too heavy'. The Western Times stated that the party did not expect women to think about the economy, the Corn question, or sugar duties, but because of their support the party should allow them to choose their own colours - in this case, rose and white. 1859. Evidence was given to a committee investigating allegations of bribery and undue influence in an election, where John H Astell had been returned as MP for Ashburton. Mr Whiteway was one of Mr Astell's agents, and at one stage Mrs Whiteway had treated a Mr Mugford and his wife to grog. She had promoted Mr Astell's cause, and 'they all knew how very zealous ladies were - what good canvassers they made'. 1908 The WSPU's* newspaper, Votes for Women, noted the principal forthcoming meetings in connection with the Mid-Devon by-election. On January 9th a women's meeting was to be held in the Town Hall at Ashburton at 3pm; and another meeting was scheduled in the Public Hall at 7pm. A meeting of the Suffragists was held in the Market Hall. Mrs. Pankhurst and Mrs. Martel were the speakers. 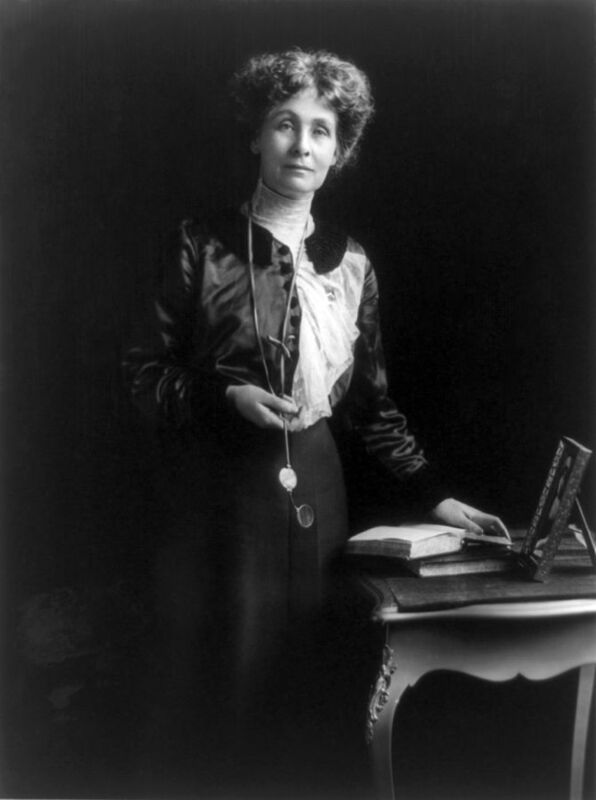 Emmeline Pankhurst founded the Women's Social and Political Union (WSPU), which by 1913 had escalated its campaign for women's suffrage. A programme of damaging public and private property resulted in many being imprisoned. In 1999 Time magazine listed Emmeline Pankhurst as one of the 100 most influential people of the 20th century. In 1913 the prospective Liberal candidate was Mr Holman. Less than two months after this speech Emily Wilding Davison, a committed member of the WSPU, ran out onto the racecourse during the Derby and attempted to grab the bridle of King George V's horse. The horse collided with her and she died from a fractured skull 4 days later. 1918 When the voters' list for the Urban District of Ashburton came out it showed that 708 men and 522 women could vote in parliamentary elections. Voters lists were being revised in 1919. A 'well known lady novelist'* was sent a form to register, and replied thus: 'I enclose form filled in as requested. I may mention that I disapprove of women's suffrage, and should never descend to the level of man by voting, so I leave it to you to register me or not, as you think fit.' The claim went through. *This may have been Beatrice Chase, real name Katharine Olive Parr, in which case she was actually from Venton, near Widecombe. Perhaps Venton came under Ashburton for voting registrations? 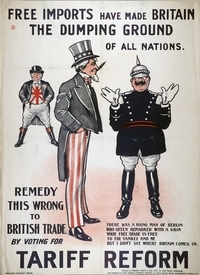 Formed in 1903, the Tariff Reform League supported Joseph Chamberlain's scheme for preferential trade treaties within the British Empire. At its peak it included many local branches, including women's sections. the party had split in the late 1800s. The issue of tariff reform then split the Conservative party. 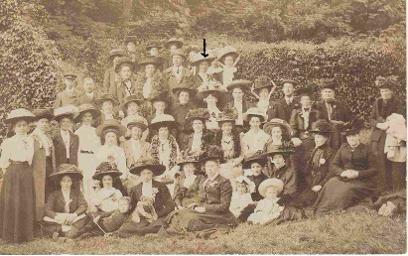 Right: This photo was sent to Minnie Butler - an arrow (contemporary) marks where she is in the group. In 1911 there were 4,500 members of the Women's Unionist and Tariff Reform Association in the Division. When Mrs Mitchell of East Street, Ashburton, died in 1912 she was described as an 'enthusiastic member of the local branch of the Women's Unionist and Tariff Reform League'. 'The General Election brought a welcome diversion, a relief from the monotony of life and a holiday from school as the school building was used as a polling station. Feelings ran high, so public meetings were held in the Town Hall, where the candidate would address the electorate. Those meetings were extremely well attended, as the only other source of political information was to be found in the newspapers: radio and television were unheard of in the twenties. Ashburton was in the Totnes Constituency and two candidates, Conservative and Liberal were the contenders. The police were in evidence at the meetings and such was the ill feeling between those of different persuasions that it sometimes led to blows. The candidate and his supporters were harassed and often tempers flared, especially when a bold man from the rear of the hall demanded to know when there was to be a Labour contender. This was like a red rag to ta bull and people rose in a fury - 'Labour in Ashburton ! Whatever next !' Many an aspiring candidate learned his craft in the village halls where he was heckled and jeered at by his audience.These meetings were almost a public entertainment, the more eloquent the speaker the greater the appreciation. All the family was caught up in election fever and children found their loyalties strangely divided - how could your best friend be a Conservative when your family were staunch Liberals ? Neighbours who had a warm relationship in normal times were cold and even hostile during the run up to an election: this was a period when politics played an important part in the life of ordinary people. Universal franchise did not arrive until 1930 and the vote was something to be thought about, and the right to go to the polls was valued. It was a privilege to be able to vote, now there was suffrage for women over 30 and memories of Mrs Pankhurst, the suffragette, were still fresh in women's minds. I well remember ('I mind tell' in local parlance) accompanying my mother to stand in North St. for an event that petrified me. The crowd waited apprehensively, then punctually at 7.30pm a charabanc came over the bridge in Kingsbridge Lane and came to a stop across North St. A man stood up and introduced a would be Labour contestant for our constituency, and then a woman appeared and delivered a dramatic and moving speech, interrupted by people from the crowd to whom at the time Labour was anathema. There was some shouting from members of the audience but there were no serious incidents, and the conveyance drove off to influence another group. There were, however, some ex-servicemen who had served in the recent war, an event never very far from those who had gone to fight for King and Country. Now they were feeling much discontent, with low wages and unemployment and a cruel method of means testing that left men embittered and disillusioned. Groups of these unfortunates gathered at 'Bottom town' and stood at the junction of North and East Street or outside Lloyd's Bank. Their wives were left at home to eke out a meal from their meagre pittance to feed husband and children. It says much for these poor souls that when the more affluent in tihe town organized jumble sales and concerts for the people in the North country, the distressed areas as they were known, they rallied around and supported these events enthusiastically and spent what little they could spare. The day of the election was the climax to the weeks of preparations. It was an occasion, where people wore their best clothes. It was also competitive - who was going to be the first man to vote ? It was very much a man's world in those days, few married women worked, so in most households the husband was the sole wage earner and usually exerted his influence over his family.